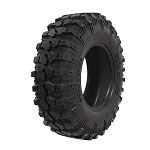 - Interco Swamp Lite ATV Tires are sold individually. 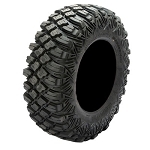 - Our Swamp Lite tires generally ship out within 1 business day! - Tread height varies from 3/4" to 1 1/2" depending on size of tire. - All terrain tire - mud, snow and hardpack. - Super strong 6 Ply construction for longer wear and rugged durability! - Built rim guard protects your wheel from dings and dents while also preventing dirt from wedging between the tire and rim. - Step-down tread pattern adds to the lug strength, and helps in reverse having more edges to grip terrain. First off, the lugs on this thing are way bigger than how they appear on the pics. I haven't used them in the trail yet, but i am happy about the way they look, and the unparalleled fast shipping! I ordered on on monday received them on a wednesday! I purchased the Swamp lites to replace the stock tires on my Daughters Honda 250ex and it was like a new bike. We do mostly trail riding but get into some mud from time to time, these tires pushed the EX through it like never before. I'm sold!!! You cannot go wrong with this tire! These tires are awesome. A lot of grip to get thru the mud. Purchased interco swamplites for a Honda recon. Totally impressed. First the 6 ply over the oem 2ply was very noticeable at the tire shop when I picked up the oem and then the swamplites. They are solid compared to the flimsy oems.Next the traction is unreal as well as the steering is much improved. Not concerned anymore about cutting a tire.Thank you Pureoffroad for the excellent service. This is my 3rd set of tires purchased this year for various atvs from you.Won't go anywhere else. Great tires for the dollar. Great bite in the muddy gumbo in East Texas and super smooth ride on hard surfaces. I have put these tires to the test by running over twigs and branches, to running over sharp rocks and through the sand up in the mountains.The lugs give it a great traction in the muddiest conditions. The ply on the tires are very good for the terrain that i covered with no punctures. When I say I have tested them, I don't mean it lightly. Ordered the swamp lites and wheel kit on Monday and received my order on Wednesday! Great customer service and super fast shipping! Cheapest place I found! The tires look awesome! Can't wait to try them out! Bought two sets for my Polaris ATV's. Crawled over the rocks much better than the 15 year old 2 ply Dunlop junk that came stock with the ATV's. We don't see much mud out here, but I have no doubts that they will perform well. First time I rode without having to pick out cactus and slime a flat. Great buy, fast shipping from Pure Offroad. Got the swamp lites to replace the stock tires on my 08 Sportsman X2, and am well pleased with my decision. I researched tires for a week or two, wanted radials but couldn't afford them so read review after review and these got a lot of accolades, so I decided to try them. I have only been able to use them a couple of times, but so far they are awesome! One of my main used for my X2 is plowing snow, and they worked awesome the 2 times I plowed, pushed a lot of wet snow and never had a problem. Traction is amazing, and they clean very well. Can't wait to try them on the trails this spring! First of all shipping is FAST, it's like they start them on their way before you click Check Out! Tires hook great in what I ride; forest loam, red clay, sandy creek bottom soil, & rocky hillsides. Before, I could expect my old tires to spin when pushing extremes, now I have to be very careful to keep the front end down! Tires ride a little stiff but I'd rather have that than butter-thin 2-plys full of plugs. Interco swamp lite, GREAT TIRE! I bought these tires for my 2007 honda recon and i love them they get the best traction in any condition and look good doing it! My friends i ride with just ordered a set for his recon too! Would definatly recomend to a friend. I put a set on my 2016 Can Am outlander 1000R, got rid of the factory tires. Did not even took my Can Am out until my swamp lite tires were on my quad. The Tires are OFF the HOOK !! Went over the snow like crazy. hooked up the soft dirt & mud, Outstanding over everything !!! Had my Can Am 1000R to 80 MPH & NO vibration at all, and a smooth smooth Ride !! I put these on my Kawasaki Prairie 4X4 and it really goes through the mud,river,over the rocks and up the hills without any trouble! Great Tires Get A Set! First of all, great customer service, I was kept aware of my purchase at all times. Great super fast shipping. I received the tires 3 working days after I ordered them. The tires are just as advertised. Plus the 6-ply rating and super deep lugs make them awesome off road. I can go places in 2wheel drive that I couldn't in 4wheel drive with the dunlops I had. great tires at a great price. Great company to purchase from, will do business again. Husband was very happy with the tires!! Pure Off Road was very helpful with technical information I needed to make my purchase. They were not the cheapest ace to purchase but every time I called and was able to speak to a real person and that is why I purchased from them. I give an all thumbs up to these tires and company ordered these tires and they were here in no time! Absolutely love them! I bought the Swamplite tires about a month ago. Let me say these tires are great!! The handling is a 100% improvement over the stock tires. I put 25 x 10 x 12 on my 2012 Rancher AT I will buy them again when its time to replace them. I purchased 27/11/14 & 27/9/14 tires 6 months ago and have put about 400 miles on them. These will get you out of any mud hole and work great in the snow. Also very pleased with the ride. The biggest problem I have had is I have torn 3 different sidewalls. I can't take it anymore, I'm shopping for something different. We were very reluctant to order tires online. But, we gave it a try. We ordered a pair of tires about a year ago. They arrived timely and were very good quality tires. When we needed more tires, we didn’t hesitate to order them, from pureoffroad.com. Once again, we were very satisfied with the second pair of tires and the timely delivery..
We are so Happy with the tires we ordered. They are everything we expected plus more. My husband flies through the snow, the traction and grip are outstanding!! We received the order quickly. I recommend this company and product!! After the fast and usual shipping, I mounted these tires and they are some pretty aggressive tires. They ride a little stiff, but that is what I like. They seem to "get a hold" in mud pretty well and I think they are going to last pretty well. I will be buying these again! Tires are awesome and a perfect fit for my Polaris Ranger 570 midsize. Shipping was super fast (1.5 days) and customer service was outstanding. Great tire for the price. We trail ride a lot. Have a set for my 2015 Polaris sportsman 570. 27 inch on 14 wheels. Got for rear tires on a 1996 Kawasaki bayou 300. 22 inch on a 10 inch wheel. These tires are fantastic. They're smooth on dirt and traction beyond all recognition. I have 4x4 all the time and my yard is tore up. I'm very happy with these tires. Did i mention how fast the shipping was? Best tires and great service. I have a CF Moto atv and was worried about bolt pattern but they fit perfectly. These tires simply The Best!!!! They hook up GREAT in the mud. Also Pure Offroad has Great customer service, and fast shipping..... Thanks Again ! i got new tires for my 2013 polaris for hunting and they work great in mud just need to see if they work good in snow. Great value for the $$ on 22X7-11. Mount easy. Good mixed terrain tire with a lean towards loose/wet. Decent cut resistance in rock if you don't push it too far. Great rim dent resistance. FAST shipping!!! Put these 27-12-12 on back of my Polaris Sportsmen 800 along with 27-12-9 on the front,great tire,very aggresive mud slinging tire, I sized up one size and am glad I did,will probably need fender extenders now cuz my wife is now having to dodge the flying mud,HA, she'll get over it, great company to do business with, so glad I clicked on their web site. This is the first time I have purchased tires online. It was very simple and my tires arrived shortly after I ordered them. The price was a lot better than what people wanted around town. The tires are for a 2wd honda. They pull in the mud very well and I did not loose any performance. If anyhing these tires weigh less than my stock ones. Good service, good prices, good prodcuts. These Tires are awesome, They have excellent traction and a very smooth ride. I've found these tires to be the absolute best running through mud, packed dirt or rocky terrain. The hold really well and the ride is smooth. The ordering process with Pure Offroad was extremely easy and I will continue to order the rest of my tires from here. Ordered tires on Tues afternoon, shipment arrived on Thurs afternoon. Great, rugged tire for the money! I bought these tires for my two wheel drive Honda. They are very aggressive tires. My old tires were 3 ply and these are 6 ply. I have ridden them a few times now and highly recommend them. They were a good buy and a good value. I bought a set of 4 Swamp Lite tires for a 1997 Honda Foreman 400. Ordered a 2:00 PM one day and they were out for UPS delivery at 8:00 AM the next day, FAST shipping is a good thing. The 6 ply tires seem to hold up well in rocky terrain, I went elk hunting near Salina, Utah and you can't tell by looking that they were ever on a rough, rocky ATV trail in the Fish Lake National Forest. Great raction in rocks and mud on those trails. Great service and helpful employees at Pure Offroad! put a set of these in 22-11-r10 on my raptor 700. they clean really well allowing my machine to go any where that that a 4wd can go. I ordered the Swamp Lite tires. I am very happy with Pure Offroad, not only did i get free shipping but the delivery was excellent. My order came very quickly. I will not hesitate to order from them again. Very satisfied with the product as well great all terrain tires. We use our Atvs daily on our ranches and the very quick service and shipping was excellent. For good service, quick shipping, and good pricing I recommend using this company for we sure will. THESE TIRES DIG!!!!! They do very good on sand, dirt, and mud. Like I said they dig huge ruts if get them spinning. Very good all around tire. I put them on a 2009 can am renegade 800. Great tire, good looks plus it pulls great in mud, sand, & is smooth on hard pack. Great all around tire that will still dig you out of trouble. Excellent tires, so much traction I've got to downshift to get more power. I noticed that turning is easier. Ride is a little stiffer but I assume that is because of being 6 ply compared to 2 ply that was on there before. Great tire, thanks. 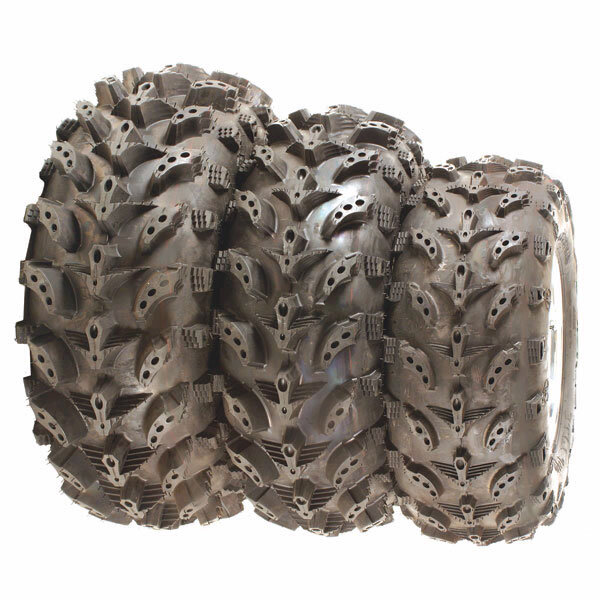 Purchase two 22x8-10 swamp lite atv tires. Great tire for the money, excellent thread for good tracktion. Fast shipping, great seller. Five star, rating.. I now have swamp lite tires on two of my atvs. I live in town and move snow with my atvs and the tread design really grips the streets and sidewalks. We also go trail riding on the weekends and the tread will rip though anything. The best feature of the tread design is the stairstep on the back side of the lugs. In the swampy mud if you spin out all you do is throw the atv in reverse and the stairstep tread will lift you up and out of your hole. Satisfied completely with the product! Fastest international shipping I have ever had and immediate response to all questions! Will deal again in the future for sure. Thanks Pure Offroad!!! These tires are great. The price is low and they are the best atv tires I've ever seen. They have a very deep and aggressive tread and will without doubt get you through any terrain. I ordered them on a Monday night and they were at my house Wednesday night. I cannot say a bad thing about Pure Offroad or their service. Their prices are fair and their shipping is fast, and free on orders over $100. I will definitely order these tires and other atv parts from them again. Great tire! the 28's have 1.77" lugs. Great in mud and hard pack. Fast Delivery! from PureOffroad.com. Received within 2 days of ordering with standard shipping! This is the second set of these tires I have purchased. The first set was for my Prairie 360 and the second set for my son's Honda Rancher. 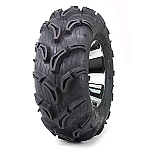 The tires are great, they offer a great ride, do well in mud, look great, overall they are everything we want in a ATV tire. We research everything before we buy and everything we read about these tires has been proven true with us. The folks at Pure Off Road are great to work with, very knowledgeable, and they ship super fast! Great product.Good price.Prompt service.Fast delivery. THE BEST MERCHANDISE, THE BEST PRICES, THE FASTEST SHIPPING, AND THE NICEST CUSTOMER SERVICE. I have ordered 2 times and been extremely pleased both times. I bought a pair of these tires and I am very happy with them. I put them on the front of my Yamaha timberwolf, not a heavy machine but these tires really supply some traction when it gets ugly out. Most of all I have to say working with the customer service people here was the most pleasant experience I've ever had while ordering anything over the 'net. I would say not to hesitate to order anything from this company, they have a lifelong customer in me now. So far have been great tires. installed on honda foreman. good bite in mud, rocks, and ride good on trails. shipping was fast, arrived in 2 days.highly recommend. After 200 miles, alot of them in deep water and mud, I'm very pleased with the tires and the bite. Went a size taller than stock and they fit good. Smooth ride at higher speeds on the gravel roads too. So far a very good choice. These have been great tires. They seem to handle the rocks very well, plus they just dig right through the mud and are still fairly smooth on the trails. Shipping was very quick and service is excellent. Highly recommend. These tires are great! They run, ride and wear great in the rough rocky mountains of Colorado. Awesome traction, use them on both my quads in the front and they never get stuck. Great tires! i have 22X11X9's on my kfx 400 (changed the gearing to 13-42) and it works awesome. great bite in sand, mud, wet snow and i can still power slide a lot too :) they actually ride quite well on the road as-well, and don't seem to be wearing that quickly. i have also had mudlites but i recommend these ones. Was concerned about the aggressive tread design, but after riding on all terain, tires turned out to be the best I have ever had. Would buy again. they bite great and ride smooth.I was not dissapointed . Q: ont he 25x12-9 is it a true 25" tire or is it smaller or larger than 25" ? A: All of the swamp lites that we have measured have been true to size. This should be right at 25 inches tall after it's mounted and inflated. Q: What ply is this tire? Was this answer helpful? 5 of 9 Customer(s) found this Answer helpful. Q: Would you be able to send me pictures of your Interco Swamp Lite ATV Tires in 22-11-9 size? How soft or firm is the tire? And would this be a good tire for a Honda 200M? A: I'm sorry we don't have a picture of the size you are requesting. This is a fairly soft tire, it does well in mud and loose terrain, they wear out faster on asphalt or other hard packed terrain. Q: How many tires do you get if you put 1 ? A: They are sold individually so if you put 1 you will only receive 1. Q: The price on 27/9/12 says $45.00 a tire is that correct cause when I go to check out its love $100 I'm wanting 4 tires this size an would like to know price? A: This tire has a starting price (or a base price) of $59 for the smallest cheapest size. As you go up to bigger sizes the price increases. There is a surcharge next to each size. The 27-9-12 has a surcharge of $45. That is why it says +$45 next to it. So they end up costing $104 per tire in that size. Q: I have a Kawasaki Mule 600 4x4 I need replacement tires that are wider and taller for a more aggressive look and handling. Most of dirt and rock area but occasionally mud. What do you recommend? A: What sizes do you currently have?